In a given state of technology when the units of variable factors of production are increased with the units of other fixed factor, the marginal productivity decreases it is called law of diminishing returns. 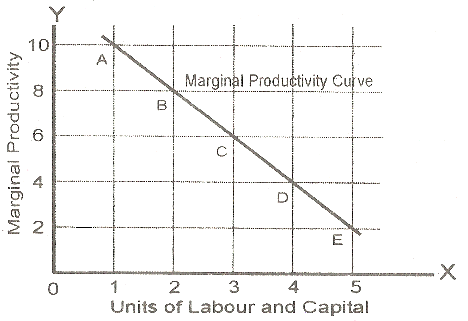 Units of capital and labor are used as variable factors. The prices of the factors do not change. There is no change in technique of production. Best combination of factors of production has crossed the level of optimum point. There is no change in the fixed factor of production. In the above schedule the marginal rate of return is at its maximum i.e. 10 tons. When an additional unit of labor and capital is employed, the marginal productivity comes down from 10 tons to 8 tons and so on decreasing. This tendency of marginal productivity to decrease as successive units of variable factors are employed to fixed factor is called the law of diminishing returns. The law of diminishing returns has its wide application. But is is especially applicable to agricultural sector. In this sector, there is the supremacy of nature plays in production corresponds to diminishing returns. Due to the following reasons, the agricultural sector is subject to law of diminishing returns. The natural factors have more role than human factors in agricultural sector and marginal productivity decreases. The sector has very wide area and supervision cannot be very effective. Scope of specialized machinery is limited. There are other limitations of seasonal nature e.g. rain, climate changes etc. The application of this law is not confined to agriculture but it applies every where. If the industry is expanded too much, the supervision will become inefficient and costs will go up. In agriculture it sets in earlier and in industry much later. Agriculture has also increasing returns in the beginning.